Twenty-two percent of 73 marketers surveyed by Digiday this April plan to move work from agencies to consulting firms. BuzzFeed is one of few digital publishers to gain significant traction in brand licensing. 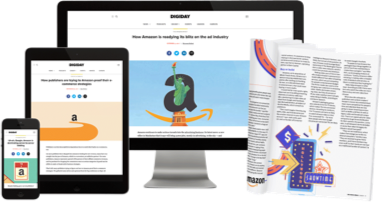 Digiday+ gives you an inside look at how digital is transforming the world of media. Join a growing list of industry executives who’ve made the decision to gain an edge, make smarter decisions, and connect with the people who matter. Our first issue of the year focuses on the shifting role of intermediaries. If there’s one rule of the modernization of media and marketing, it’s that the role of intermediaries is changing, in some cases becoming all-encompassing and in others (agencies) waning.